Read what The Employment Network Magazine clients are saying! I want to share with you that I interviewed a candidate this morning that had seen our ad in your magazine. We are offering them a position! This is a good return on our investment with you and we hope the employee stays with us for a long time. 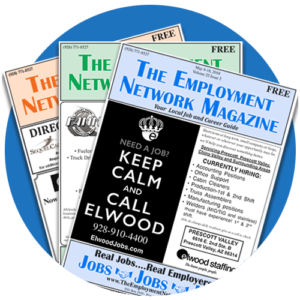 Yavapai County has been advertising with THE EMPLOYMENT NETWORK MAGAZINE for many years. We find the pricing to be very affordable. Additionally, the wide distribution of the magazine along with the great website makes it well worth the cost. I would like to give a shout out to Bob and Lisa for their impeccable customer service. You are always there to help me, and I thank you. Keep up the great work! Wanted to let you know how much our advertising with The Employment Network has benefited our recruiting efforts here at the Clinic. We appreciate your publication’s capacity to attract qualified applicants to fill our staffing needs. Thanks and keep up the good work!